Recently, the campaign, run jointly by the Scottish Campaign for National Parks (SCNP) and the Association for the Protection of Rural Scotland, has sponsored a petition to try to get Scottish Ministers to rethink their position of "no new parks". As I write this, the petition has generated a fair bit of interest with articles in many of the newspapers. By the time that Mountain Views is published, the petition will have closed. I hope that you all saw my email on the subject and had a chance to decide on whether to sign it. NEMT's position is that there is a lot wrong with the governance of our two existing parks, particularly the Cairngorms Park Authority, but that it shouldn't stop us trying to do better the next time with, hopefully, the next park. I thought that it was appropriate to repeat here the summary from the campaign's report, "Unfinished Business" and have reproduced it below. National Parks bring a wide range of environmental, social and economic benefits. There is substantial national public support for National Parks, and local support for designating further National Parks in some parts of Scotland. There remains a strong case for designating more National Parks in Scotland. 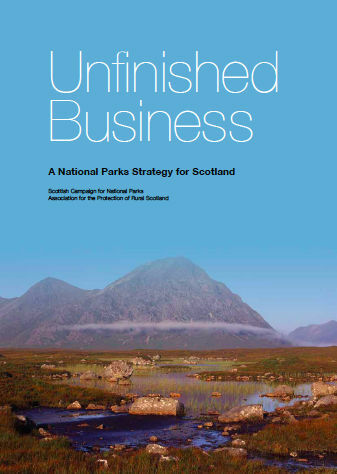 There is scope for improvement in the Scottish Government's operation of the two existing National Parks and any future ones. The Scottish government should therefore prepare and implement a strategy to designate more National Parks in Scotland, including at least one Coastal and Marine National park. This strategy should be fully integrated with the National Planning Framework, the sustainable Land Use Strategy and the National Marine Plan. A full copy of the report can be obtained from either the SCNP or the ARPS website. It is now two years old but remains very relevant. If you haven't already read this report, I encourage you to do so.